I haven’t made these in ages, but somehow this weekend called out for a batch of Sticky Balsamic Chicken Drumsticks (with Honey & Sriracha). We have a nicely balanced sweet-sticky-and-spicy thing going on here, but this recipe really is customizable to your own family’s tastes. Want it sweeter? Add a little more honey. Want more of a kick? Add a little more Sriracha. It’s hard to go wrong… Just look at the layers of flavor caramelized on there! 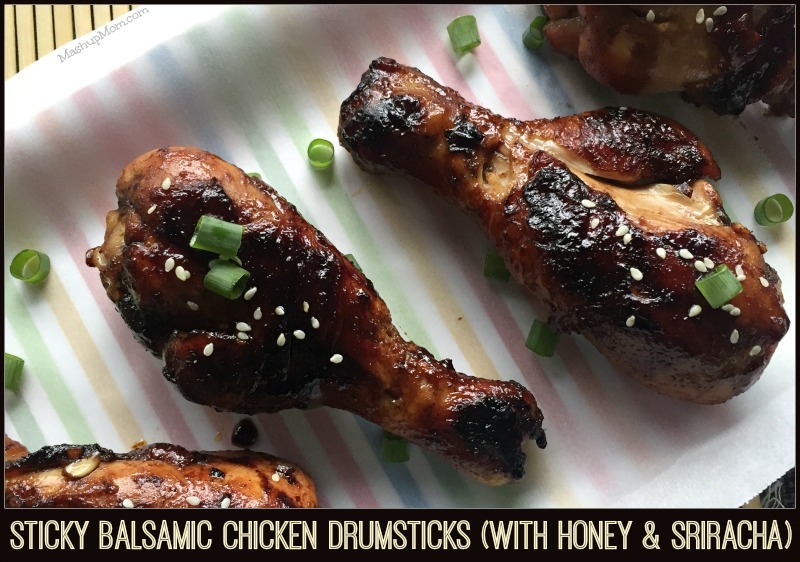 For this batch of Sticky Balsamic Chicken Drumsticks I used a little pack of clearance drumsticks that I picked up with a coupon, but drumsticks are generally affordable (and often go on sale at ALDI and local produce stores). 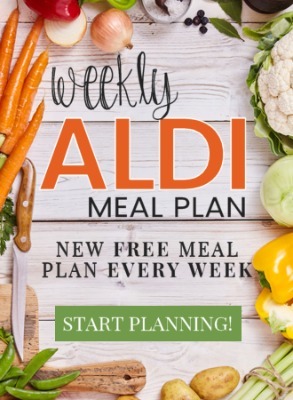 So, chicken drumsticks are always a frugal option for Sunday Scratchups recipes: That weekly recipe we do here around grocery sales & affordable ingredients! Whisk together honey, Sriracha, balsamic vinegar, soy sauce, garlic, and oil in a large bowl. (Taste the marinade at this point to see if it’s the right balance of sweet & spicy for you — add a little more honey if you want it sweeter; add a little more Sriracha if you want it spicier.) Pour half a cup of the marinade into a small saucepan and reserve. Trim excess skin off drumsticks, if necessary, then add them to the bowl with the marinade ingredients. Toss to coat and let the chicken sit for 15 minutes, turning over a couple of times to ensure that the drumsticks are well-coated with marinade. 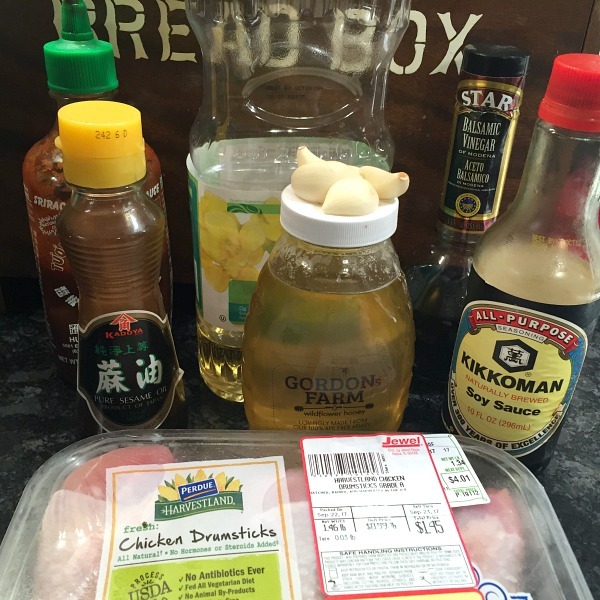 Remove the chicken drumsticks from the marinade, arrange them in a single layer on the prepared baking sheet, and cook at 400 degrees for 20 minutes. While the chicken is roasting, simmer the reserved half cup of marinade in a small saucepan over medium-low heat until reduced and thickened (about 15 minutes). You’re going to use this reduced marinade to baste the chicken a few times, so that you get some nicely caramelized layers of flavor. After drumsticks have roasted for 20 minutes, remove them from the oven and brush each with the reduced marinade. 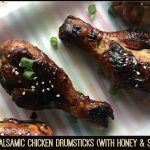 Flip drumsticks carefully with tongs and brush the other side with marinade, then return to the oven for 10 minutes. 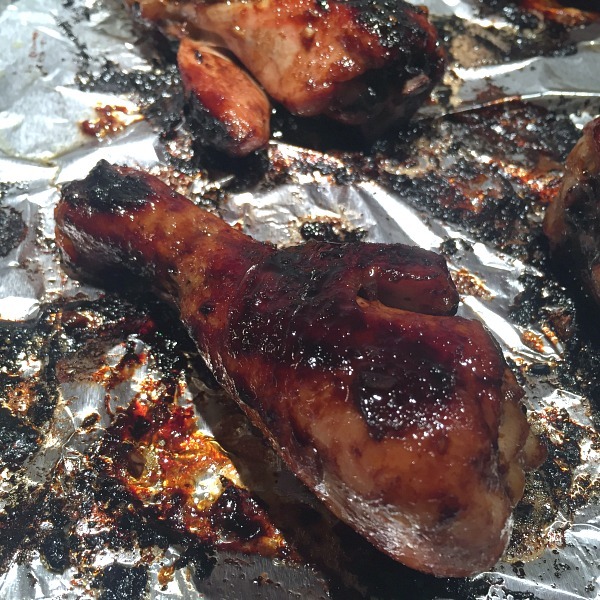 Remove drumsticks from oven and brush both sides with the last of the marinade. Return them to the oven and broil for one minute to brown nicely, then serve your sticky balsamic chicken drumsticks topped with green onions and/or sesame seeds (optional). Note: Cooking times may vary depending on the size of your drumsticks, so check for doneness with a meat thermometer and adjust as necessary. Sweet, Spicy, and Sticky — What more could you ask for? If you want to maximize the benefits of this recipe, just make a double batch along with a big pot of rice. That lets you shred any of the leftover drumsticks you are able to pry away from the children, and then use that super-flavorful shredded chicken + leftover cooked rice to make a delicious batch of fried rice for dinner the next night. 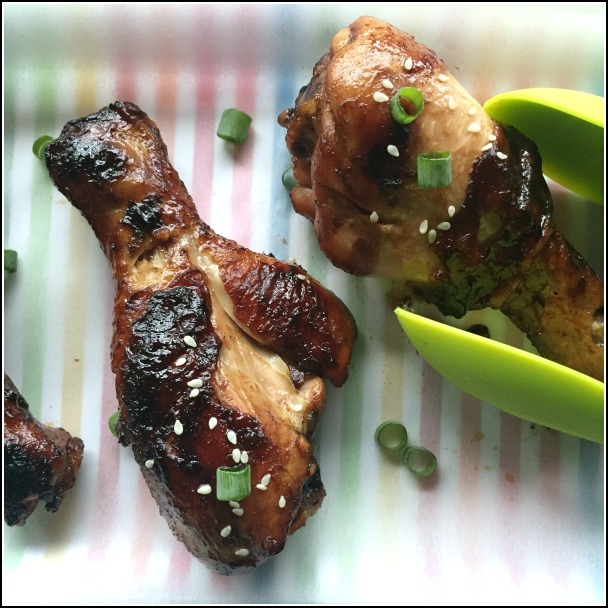 The Sriracha does add a little kick, but the recipe as written is more sweet than spicy -- making it stickily kid-friendly! Whisk together honey, Sriracha, balsamic vinegar, soy sauce, garlic, and oil in a large bowl. (Taste the marinade at this point to see if it's the right balance of sweet & spicy for you -- add a little more honey if you want it sweeter; add a little more Sriracha if you want it spicier.) Pour half a cup of the marinade into a small saucepan and reserve. While the chicken is roasting, simmer the reserved half cup of marinade in a small saucepan over medium-low heat until reduced and thickened (about 15 minutes). You're going to use this reduced marinade to baste the chicken a few times, so that you get some nicely caramelized layers of flavor. Cooking times may vary depending on the size of your drumsticks, so check for doneness with a meat thermometer and adjust as necessary.